Adrian Dutton recently contacted us regarding a record of Derephysia foliacea (Fallén, 1807), Nottinghamshire's first record in just over a century. J.W. Carr lists historical records from Sherwood Forest in 1912, Thorney in 1913 and both West Leake and Aldercar Wood, Newstead in 1914. Numerous searches of Ivy (Hedera helix) growing in a variety of situations and habitats over recent years, had failed to find any trace of this Lacebug, but it was finally recorded by Adrian Dutton at a site in the Carburton/Clumber Park area on 06/07/17. We had been requested not to report this item at all, but as we are in the business of promoting the invertebrates of Nottinghamshire, we felt obliged to provide some brief details. Thanatus formicinus (Clerck, 1757) has been recorded in the UK, for the first time in nearly 50 years and was found by Lucy Stockton during some voluntary survey work at the National Truts's Clumber Park. It is a distinctive spider and one which is easily identified in the field. It was previously known from Beaulieu Heath, South Hampshire and two heathland sites in East Sussex. The spider was recorded from all three locations prior to 1969 but it has not been recorded at any of them since. It represents another quite remarkable record for Nottinghamshire. Clifden Nonpareil Catocala fraxini (Linnaeus, 1758) was recorded as new to Nottinghamshire on September 6th, when attracted to MV light at Lound GP/Idle Valley NR by Ian Hunt and Phil Cadman, both members of the Lound Moth Group. Officially confirmed as being new to VC56 by the county recorder Sheila Wright, this largely migratory moth was another fantastic record for both Ian and Phil, following up from the Pinion-streaked Snout trapped at the end of August. Since the turn of the present century, there have been records from all of the vice-counties south of the Thames, as well as a handful of counties north including neighbouring Lincolnshire and it seems certain to be breeding again in some southern counties. The regular occurrences of Clifden Nonpareil to a few light traps operated south of the River Thames, makes it more difficult to determine dispersal from genuine migrants, but this should not detract any importance from this record. 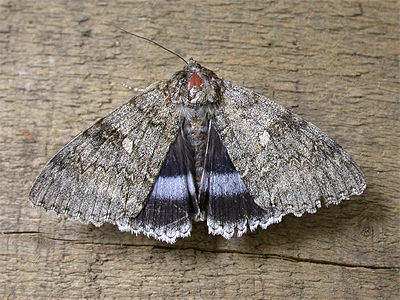 The occurrence of Clifden Nonpareil in Nottinghamshire (this one was a male) is a remarkable record and just reward for the continued effort by its recorders. Datewise, the Nottinghamshire record falls in pretty well with other recent UK records and a quick internet search, produced the following number of recent records from the UK. There does not appear to have been any really notable influxes in recent weeks. 04/09/17 Highworth, Wiltshire (Nash, S. per Facebook); 04/09/17 Maidenhead, Berkshire (Finch, L. per Facebook) ; 03/09/17 Butleigh, Somerset VC6 (per Atropos website); 30/08/17 Cranmore, Isle of Wight (Clarke, J. per Atropos website); Bonchurch, Isle of Wight (per Atropos website); 29/08/17 Bexhill on Sea, East Sussex (Scanes, J. per Atropos website); 28/08/17 Crawley Down, West Sussex (Clarke, J. per Atropos website); 28/08/17 Garsington, Oxford (Griffiths, M. per Atropos website); 26/08/17 Crawley Down, West Sussex (Clarke, J. per Atropos website); 25/08/17 Crawley Down, West Sussex (Clarke, J. per Atropos website) and 17/08/17 Crawley Down, West Sussex (Clarke, J. per Atropos website). The tiny, but stunning Andromeda Lacebug Stephanitis takeyai (Drake and Maa, 1955) has surprisingly turned up in Nottinghamshire again, so soon after the county's first in 2016. 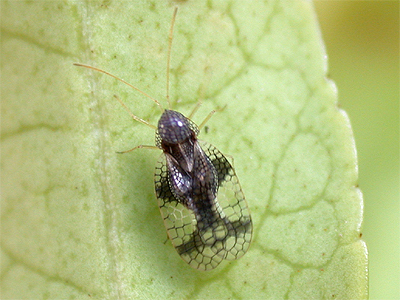 There are currently few UK records of this Japanese species, since it was first recorded back in 1998, so the finding of this Lacebug at the Nottinghamshire Wildlife Trust's Attenborough Nature Reserve in 2016 by Tim Sexton, represented a remarkable first county record in its own right. The fact that Tim recorded it while sweep-netting marginal vegetation was even more remarkable, as the Andromeda Lacebug is usually found on the garden shrubs Pieris and Rhododendron. That a quick follow up record came from our own Market Warsop garden in late August 2017, perhaps suggests that Stephanitis takeyai is well established in the county? It would have to be quite a coincidence for Nottinghamshire's only two specimens to be recorded by the only people actively recording Lacebugs, although it has to be said, that our own record of Stephanitis takeyai actually found us - by landing on the patio table we were sitting at! The fifth record of Pinion-streaked Snout Schrankia costaestrigalis (Stephens, 1834) for Nottinghamshire SINCE 2003, was recently trapped by Ian Hunt, Martin Warne and Phil Cadman - all members of the Lound Moth Group. 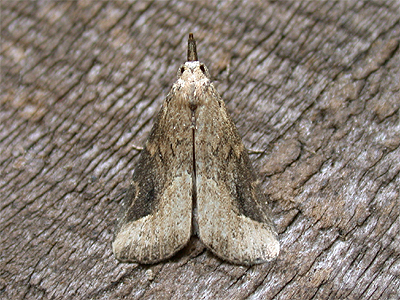 Pinion-streaked Snout is a rare moth in Nottinghamshire, predominantly occurring in wetland habitats. Since 2003, there has been a scattering of records (now five) from a line north-east of Ravenshead, to Misson Carr in the very north of the county. Only the night before trapping the Pinion-streaked Snout at the Idle Valley NR, Phil had recorded an even rarer Nottinghamshire moth from his Worksop garden, in the form of Metilella fusca (Haworth, 1811). There are reports that Metilella fusca (known to be a heathland species) may be turning up in gardens more regularly, through the increased use of ornamental Heathers. Phil's Worksop record would appear to support this theory. We know of just one other recent Nottinghamshire record, that of an individual recorded from the Rothamsted trap run at the Sherwood Forest Visitor Centre in 1987 (Bee, L and Parrack, J.D.). Our thanks go to Ian and Phil from the Lound Moth Group, for kindly allowing us to photograph the moth. Haplophthalmus mengii (Zaddach, 1844) is a tiny subterranean Woodlouse, which seems to have been unknown from Nottinghamshire, until we found a specimen at Ransom Wood in August 2017. Visually identical to Haplophthalmus montivagus (Verhoeff, 1941) the discovery of Haplophthalmus mengii at Ransom Wood, is almost identical to the circumstances of our discovery of Haplophthalmus danicus at Sherwood Forest CP earlier in the year - being found within rotting bark chippings on the woodland floor. Originally discovered new to Nottinghamshire in September 2016, when we found several specimens at the Southwell Garden Centre, we recently recorded Armadillidium nasatum (Budde-Lund, 1885) from the site of the former Bilsthorpe Colliery in July 2017. Part of this brownfield site is ear-marked for a new incinerator, and this remains only the second site in Nottinghamshire where A. nasatum can be found. Fairly similar to Armadillidium vulgare, A. nasatum is rather patchily distributed across the UK south of the Humber. 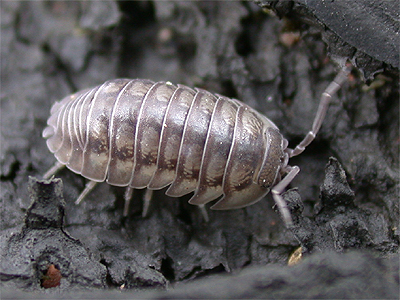 A well-marked Pill Woodlouse, which is surprisingly quick to move when disturbed, it is often found in old quarries, garden centres and brownfield sites. We were recently sent a large number of records (mostly coleoptera) from Charlie Barnes, the Lincolnshire Naturalists' Union recorder for beetles. Most of Charlie's records are from the Trent Valley area, in particular Collingham, Langford Lowfields and Besthorpe. Not surprisingly, there are records of some beetles rarely found in Nottinghamshire. Of particular note are three records of Panagaeus cruxmajor (RDB1) from the Langford Lowfields area. This was first found in 2014 (Wallace, J.) when it was originally identified as being the commoner Panagaeus bipustulatus. There's also a recent record of the Elaterid Oedostethus quadripustulatus, which was beaten from drainside vegetation at Besthorpe by Charlie in July of this year. With an hour to spare recently, we visited Fountaindale near Mansfield and paid an impromptu visit to the site of a now demolished house and large derelict garden, situated at the edge of woodland on the A60 Mansfield to Nottingham road. Our visit was useful in providing first county records of the colourful Mirid Bug Dichrooscytus gustavi (Josifov, 1981) and the Longhorn Beetle Stictoleptura rubra (Linnaeus, 1758). Although the Nottinghamshire status of both insects is not totally clear, both are presumed to be new to VC56. Once restricted to chalk downland in southern counties of the UK, Dichrooscytus gustavi still has a largely south-easterly UK range, but has spread north with the planting of Juniper in gardens. 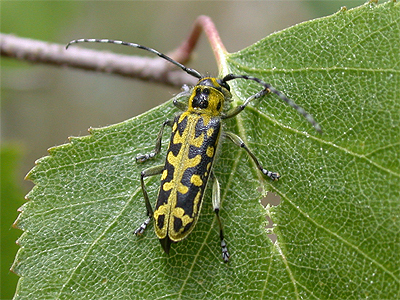 The Stictoleptura rubra record is almost certainly the first record for Nottinghamshire of this distinctive Longhorn. It is common in East Anglia and has spread into other parts of the UK, including south Wales, no doubt benefitting from the widescale planting of commercial Pine Forestry. Least Carpet - a new Nottinghamshire moth? Recently recorded and suspected as being new to Nottinghamshire in July 2017, when attracted to MV light at Phil Lee's Misterton garden in the north of the county. Formerly restricted to south-eastern counties of the UK, Least Carpet Idaea rusticata ([Denis & Schiffermüller], 1775) has spread inland and northwards in recent years, so it is perhaps surprising that it has taken so long to be recorded in Nottinghamshire. Our thanks go to Phil for informing us of the record and for providing us with the accompanying photograph. Hills and Holes SSSI at Market Warsop, is an area of special scientific interest, yet is still under the real threat of residential development on land which borders a large section of the site. Its present close proximity to houses, means that it already suffers the affects of camp fires, rubbish tipping and alcohol and drug abuse by local teenagers. Despite that, it is still a site with plenty of potential, but is grazed far too often. Late June is a good time to visit and when we visited on June 25th, we recorded two Mirid Bugs with apparently no recent Nottinghamshire records. 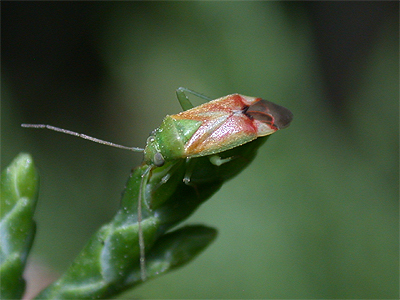 Heterocordylus genistae (Scopoli, 1783) is an inconspicuous Mirid bug and extremely similar to Heterocordylus tibialis. The host plant is a reliable guide to species, as H. genistae prefers Dyer's Greenweed and H. tibialis prefers Broom. Heterocordylus genistae probably has a restricted range in the county, probably in much the same way as Macrotylus paykulli (Fallén, 1807). Macrotylus paykulli is very small Mirid, almost appearing like a tiny fly as it frequently takes flight between stems. It has a largely coastal UK distribution, although there is a string of records occurring down the middle of the country. It is certainly known historically from Nottinghamshire, but we can currently trace no recent records. It occurs on the stems and flowers of Rest Harrow (Ononis repens). On June 22nd, we paid a short visit to the site of the former Bevercotes Colliery. Now renamed Bevercotes Pit Wood, it is one of the better former pit tops for wildlife in Nottinghamshire. Along the entrance road, there is a more or less, permanent shallow puddle, part vegetated to its rear and bare tarmac around most sides. It often turns up something interesting and a small Carabid found under an old house brick, turned out to be the Nationally notable B Anthracus consputus (Duftschmid, 1812). Anthracus consputus is usually found under stones near still water, and despite the NBN listing five post-1992 records for Nottinghamshire, we found that none actually orignated from VC56 and are in the neighbouring counties of Leicestershire and Lincolnshire. Following on from the recent Budby SF record of Oedemera nobilis, we recorded it for the first time at Warsop Main Pit Top, Warsop Vale on June 24th. This recent (2011) Nottinghamshire colonist, continues to rapidly colonise new areas of the county, seemingly following a period of consolidation lasting several years at Trent Valley sites in the south of the county. Tucked away within a small selection of coleoptera records we received from Howard Williams towards the end of June, was a record of the strikingly marked Silphid Dendroxena quadrimaculata (Scopoli, 1772). Thankfully, Howard had attached photographs to accompany his records, and very kindly allowed us to use the one on the left. Dendroxena quadrimaculata is a hunter of lepidopterous larvae, found nocturnally on the foliage of trees and bushes, but hiding in leaf litter and moss at the base of trees during the day. It always seems to have been rare in Nottinghamshire, with at least two historical records from Clumber Park (per NBN Atlas). Howard's Dendroxena record came from Hundred Acre Wood near Worksop on June 12th 2010. The only other recent Nottinghamshire record, appears to be F.A. Hunter's record from Sherwood Forest Country Park in 1978. Often more commonly known as the Swollen-thighed Beetle, Oedemera nobilis is a recent Nottinghamshire colonist which has spread north through the UK over recent years. It was first recorded in Nottinghamshire at Holme Pierrepont in June 2011 (Dutton, C.) and over the next few years, soon appeared at several other Trent Valley sites in the south of the county. It remained commonest in south Nottinghamshire, but was found at the Nottingham Trent University's Brackenhurst Campus in 2016 (Heeney, W.) and most recently as far north as Budby South Forest in June 2017. The adult beetles are regular visitors to flowers and are conspicuous by their quite large size and metallic green colouration. Following first Nottinghamshire records at Attenborough NR (Sexton, T.) and the Dukeries garden centre (Pendleton, D.T. and Pendleton, T.A.) near Worksop in September 2016, we found a female Steatoda nobilis at a second Garden Centre, this time at Mapperley, Nottingham in early June 2017. Incorrect, sensationalist reporting has done Steatoda nobilis no favours and to be honest, neither has the grossly exaggerated over-reaction of a proportion of the general public. 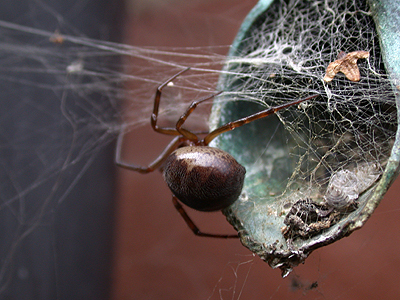 Although known to have been spreading north for a number of years now, there seems little doubt that the horticultural trade has helped Steatoda nobilis increase its range and it must be present at other garden centres and possibly DIY outlets. Once regarded as being rare, the Hummingbird Hawk-moth Macroglossum stellatarum (Linnaeus, 1758) has become an increasingly regular migrant to Nottinghamshire over recent years. Records peak in August and September, following arrival from late May onwards. Red Valerian is a great attractant to this day-flying moth and to date (June 1st) we have already had two records from our Market Warsop garden. These records have coincided with an arrival of Silver Y's from May 22nd, but especially from May 28th onwards when numbers increased. A pupa of the Glow Worm (Lampyris noctiluca) found during a late evening survey on May 25th, was found to have two examples of the small Staphylinid Alaobia scapularis (Sahlberg, 1831) in attendance. Alaobia scapularis is known to predate Glow Worm larvae and pupae, but the only other Nottinghamshire record we know of, is of two we found with a female Glow Worm pupa at Clipstone Old Quarter on May 30th 2013. We checked the pupa on subsequent nights, in an attempt to secure a specimen for photographing. After missing a third Alaobia scapularis on May 27th, we were eventually successful two evenings later. A widespread and common species over southern counties of the UK, the impressively large Dock Bug Coreus marginatus (Linnaeus, 1758) is currently known from just a handful of sites in Nottinghamshire. 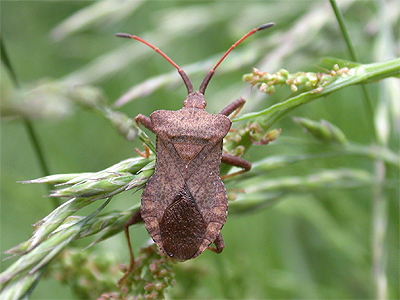 But the surprise finding of this species on Sorrel at the Sherwood Forest CP on May 28th, brings an end to Nottinghamshire's Dock Bug records, all being from within close proximity to the City and in the Trent Valley. Nottinghamshire's first record seems to have been from Netherfield in 2012, with more recent records coming from Attenborough NR, Colwick Park and close to Nottingham City Hospital. In Nottinghamshire, our own records would suggest that this typically black, shiny Chrysomelid, is quite unusual away from the Sherwood Forest area. So we were surprised when we found it on May 24th, at Hills and Holes SSSI at Market Warsop in late May. This record was quickly followed up the next day, by two more found in a regular area of Sherwood Forest CP. Chrysolina oricalcia Nb (Nationally Scarce Grade B. Recorded in 31-100 10km squares since 1980) can be quite common where it occurs, but we have previously only found it at several locations within the Sherwood Forest area and usually only on on Cow Parsley growing in part-shaded positions. We have recorded it once during the Winter months, on a mild late November evening in 2008, when one was found at the base of a tree during a moth trapping session near the Major Oak. We've been doing a bit of work on Diptera recently (May) and have recorded the following species, for which there are few, or no, records for the Sherwood Forest NNR. Believed to be the first Sherwood Forest records in just over a century - Bibio leucopterus and Bibio nigriventris (Bibionidae), Empis opaca and Empis stercorea (Empididae). Species believed to be totally new to the NNR include Bibio hortulanus, Bibio varipes and Dilophus femoratus (Bibionidae); Empis digramma (Empididae); Bellardia viarum (Calliphoridae) and Voria ruralis (Tachinidae). Although there may be many other beetles with a much rarer national status in Nottinghamshire, probably none can match the colours and markings of the Longhorn Saperda scalaris. It currently holds Nationally Scarce Grade A status, meaning it has only been recorded from 16-30 10km squares in the UK since 1980. The larvae live in dead branches and it's range in Nottinghamshire appears largely restricted to the Sherwood Forest area. The majority of records have come from within the Sherwood Forest NNR and Clumber Park and our own records include singles on low vegetation at Bradmer Hill near Market Warsop on June 5th 2007, on a log pile at Sherwood Forest CP on June 18th 2010, 30 feet up a Birch at Sherwood Forest CP on May 7th 2011 and on a small Birch at Sherwood Forest CP on May 14th 2017. 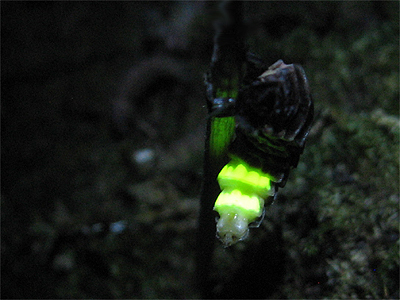 We often get asked "when the first Glow Worm will emerge each year?". Its a difficult question to answer and you would think that after monitoring the larval population of a colony for the best part of a decade, that we would have some idea by now. Such predictions are difficult and largely guesswork at best, but there are other factors to take into consideration. The ability of Glow Worm larvae to find food (over at least two years) is one, especially during periods of prolonged dryness. The Sherwood Forest area has undergone periods of very dry conditions which leads to dehydration in Glow Worm larvae. During some larval surveying in the late Summer and early Autumn of 2013, we found that some larvae were becoming paper thin and when rain did eventually arrive on September 6th, we found larvae taking on much needed water. The variabilities of the UK weather is without doubt the biggest factor in determining when any species will appear. Not just around the time of adult emergence, but over the course of the previous few months and probably well over the past year of larval life in Glow Worms. 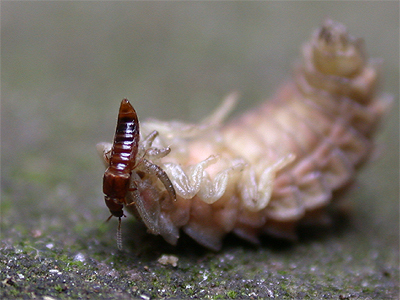 For larvae going on to become adult this Summer, then having suitable weather conditions for hunting (warm and damp) and the ability to find enough food during the previous Autumn, is likely to be much more critical than during the Spring, as most pre-pupation development will already have taken place. We have had over-wintering larva in captivity, which never ate anything before pupation. Seasonal variations have tended to produce very mild Winters, often with a short spell of snow or icy conditions. The past couple of Winters locally here, have barely produced a frost, let alone snow. We have just experienced yet another very mild Winter, which eventually developed into another cool and dry Spring, which was an almost carbon copy of last year. With a number of Glow Worm larvae appearing relatively early in March, it had looked promising for a potentially early start to this year's glowing season. But then the weather changed and most nights became cool, with the overnight temperature often dropping well into single figures. Although there were few nights with a ground or air frost, the cool nights and lack of any real warmth during daylight hours, meant that the prospect for any early females would now seem unlikely. A lack of rain probably hasn't helped matters either and some larvae found during our surveys were quite thin. A look at the average monthly minimum and maximum Winter temperatures for the period 2008-2017, shows that the two years producing an early Glow Worm season, came when the average minimum temperature was over 3.5°C and the average maximum temperature was over 10.5°C for the period January to April for both years. We have just read the average temperatures for April and the average minimum temperature for January to April 2017, is 3.5°C and the average maximum is over 10.0°C. It is possible that this years season could be another early one after all. The first Hazel Pot Beetles (Cryptocephalus coryli) of 2017, were found high up Birches on May 12th. This RDB1 and UKBAP priority beetle's only known UK site of recent years was believed to be Sherwood Forest, but was reported from Clumber Park in July 2013 by Allan and Annette Binding. We know C. coryli seems to be doing well at Sherwood Forest, but it is strongly believed to still be present at Box Hill and Headley Warren in Surrey (per Denton, J. and Collins, G.) but no one has purposely looked for it in the last few years. There have also been no records from Woolmer Forest in Hampshire, since it was recorded there for the first time in 2002 (Lawn, M.) despite further searching and there have been no records from any Lincolnshire site other than Whisby since 2007 (per Barnes, C.). Tim Sexton recorded the Mirid Bug Agnocoris reclairei (Wagner, 1949), from Attenborough NR in April 2017, which looks set to be the first record for VC56. 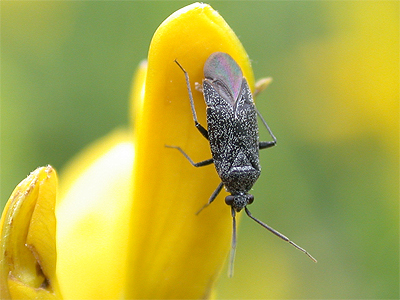 Something of a wetland species, Agnocoris reclairei had traditionally been restricted to the Fens of Cambridgeshire and Norfolk, but it appears to have undergone a range increase in recent years. There is a single record from Derbyshire listed on the NBN Atlas. 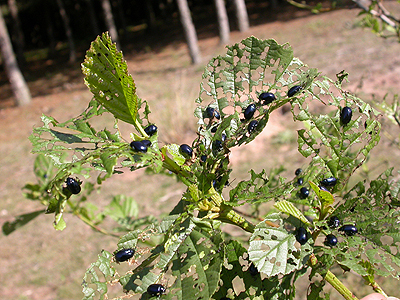 Agelastica alni (the Alder Leaf Beetle) continues to spread to new areas in the north and north-west of the county. In early April, we recorded 30 adults around the Idle Valley Rural Learning Centre, recently emerged and already defoliating some nearby young Alders. This is the most easterly Nottinghamshire record we know of, and we would expect them to be in nearby Retford. 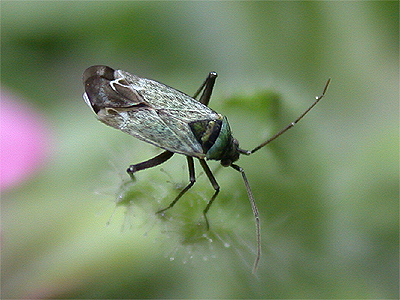 Agelastica alni had previously been recorded from five Nottinghamshire sites. All but one of these (Dyscarr Wood) were former Colliery sites and all are in the north-west of the county around Mansfield and Worksop. Nottinghamshire's first record was from Dyscarr Wood, when it was found and photographed by Pauline Bradford on June 11th 2014. We visited the Nottinghamshire Wildlife Trust's Besthorpe nature reserve, just north of Newark on the River Trent on a sunny but windy day in late March. A few interesting species were found, including the impressive ground beetle Carabus granulatus (Linnaeus, 1758), while checking the fruiting bodies of the fungus Daldinia concentrica (more often known as King Alfred's Cakes), provided us with the beetles Platyrhinus resinosus (Scopoli, 1763) and Biphyllus lunatus (Fabricius, 1787). Of special note, were several larval cases of Luffia ferchaultella (Stephens, 1850) found on an old gate post in the reserve's small car park. Luffia ferchaultella is a wingless, self-fertile Psychid moth and this record is the first from a site east of the River Trent. 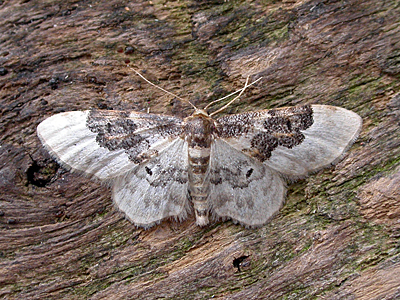 There are several known sites for this moth in Nottinghamshire, most of which are in urban areas. Chloe Ryder of the RSPB reports that two Black Oil Beetles (Meloe proscarabaeus) were already active on February 23rd. This is the earliest date we know of since they were found back in 2011, beating last year's early date of February 28th, by some five days. The rediscovery of the Oil Beetle in Nottinghamshire for the first time in over a 100 years, provided the chance to monitor the colony over successive years. The discovery by Adrian Dutton and his wife in 2011, was followed a couple of years later by the discovery of a second colony in the grounds of Newstead Abbey in 2013. Both colonies have continued to survive, but there must surely be other colonies elsewhere. In late February we recorded several examples of the Millipede Melogona scutellaris (Ribaut, 1913) from under long-standing rockery stones in a Mapperley garden. Melogona scutellaris is a typical Millipede of synanthropic habitats (associated with human activity, buildings and gardens etc) and should likely be present at other locations in the county. The same mature garden has produced other records of similarly scarce county Millipedes in recent years, showing that suburban gardens can be excellent sources of invertebrate records. The increased interest in the county's Myriapods and Isopods over the past few years, continues to provide interesting records during the early months of each year, when records from other invertebrate orders are few. Although the identification of some species can be difficult, their often synanthropic habits tend to make them easily accessible in seemingly unlikely locations deep within our towns and cities. In February, we took several specimens of what turned out to be Choneiulus palmatus (Nemec, 1895), from under a large stone, lying on top of bark chippings at the old north entrance of Nottingham's City Hospital. Choneiulus palmatus is a difficult Millipede to identify to species level and almost impossible to separate from Proteroiulus fuscus and Nopoiulus kochii without the aid of a microscope. Its very much a Millipede of buildings and urban sites and a surprise second Nottinghamshire record, following a record from Church Warsop in March 2015. 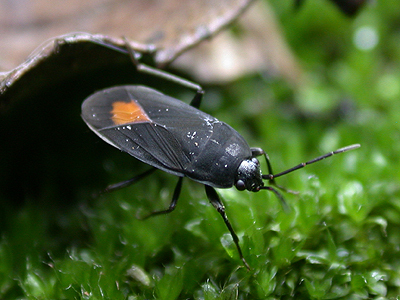 Aphanus rolandri (Linnaeus, 1758) is a large, black Ground Bug (Lygaeidae) with a distinctive red or orange spot at the base of the wing membrane, making it almost unmistakable and with no real confusion species. Previously unknown from Nottinghamshire, the one that turned up in our Market Warsop garden on a mild afternoon in mid-February 2017, was soon confirmed by Dave Budworth and Jim Flanagan, as being a new species for Nottinghamshire and probably the most (reliable) northerly UK record to date. A. rolandri is known to occur on dry, well-drained sites, such as chalk pits, cliffsides and has been known from cultivated fields. Found predominantly in the south-east of the UK, there are a scattering of records from Midland counties. Trichoniscoides albidus (Budde-Lund, 1880) is a small Woodlouse, similar in appearance to Trichoniscus pusillus (Brandt, 1833) and usually found under stones in wet/damp locations. It was only discovered new to Nottinghamshire in January 2016, when found at two sites on the River Trent at Farndon near Newark by Derek Whiteley. In early February 2017, we found it in good numbers under large items of flood refuse at Stoke Bardolph. 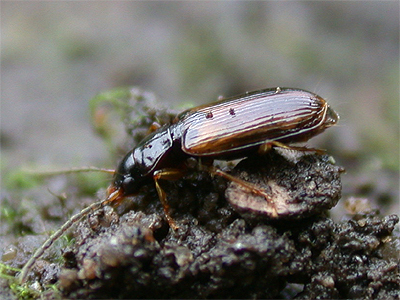 Trichoniscoides albidus is likely to be common along many river courses throughout Nottinghamshire, but especially along the Trent Valley. Not having had much chance to get out this Winter, we managed a walk up Clipstone Old Quarter near Edwinstowe on January 22nd. On reaching the limit of our walk, we stopped to look underneath a large section of branch which fell off the Centre Tree a number of years ago. Despite the frost we found three active Millipedes, one of which was male and later confirmed as being Chordeuma proximum (Ribaut, 1913) a species we had recorded as new to Nottinghamshire (VC56) at King's Clipstone in January 2015. This Millipede must be fairly widespread in the Sherwood Forest area and this record also represents a new species for the Sherwood Forest NNR. Assistant reserve manager Tim Sexton, reports he recently recorded the bark beetle Cicones undatus (Colydiidae) at Attenborough Nature Reserve. 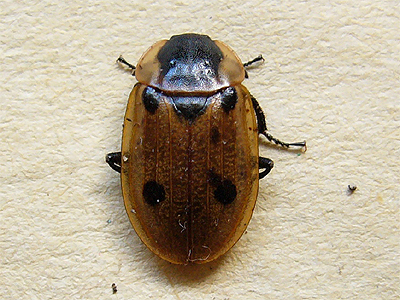 The January record seemed to be unusual and at first was believed to be a new species for the county, but it seems the beetle was recorded at Stoke Bardolph back in 2004 by Adrian Dutton. Cicones undatus (Guérin-Méneville, 1835) is a small (2.5-3.5mm) beetle and several were found under bark at Attenborough NR by Tim in January 2017. A relatively recent colonist of the UK, it was discovered at Windsor Great Park in 1984 and has since been recorded from other south-eastern counties. It is believed to be associated with Sooty Bark Disease of Sycamores, caused by the fungus Cryptostroma corticale.